A 47-year-old man with no significant medical history presented with a 2-year history of gradually enlarging bilateral gynecomastia and left breast tenderness. Initial work-up with mammography and ultrasound was unremarkable, aside from left greater than right bilateral gynecomastia. The patient’s BI-RADS score on initial work-up was 2 (benign). Over the next few months, the patient developed a lump in the left breast and numbness and tingling in the left arm. 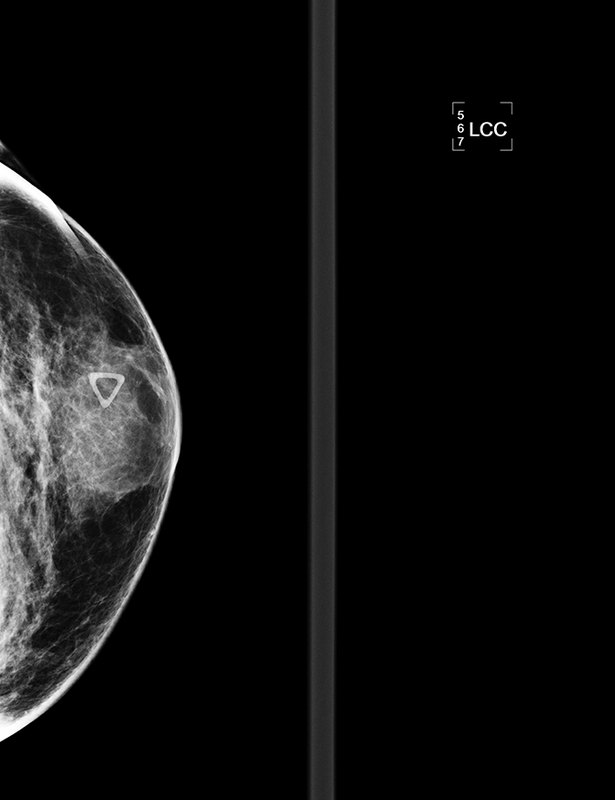 Repeat mammogram and ultrasound now demonstrated left breast findings that were more mass-like, with a BI-RADS category of 4A (suspicious). Biopsy of the breast mass demonstrated classic Hodgkin’s lymphoma. 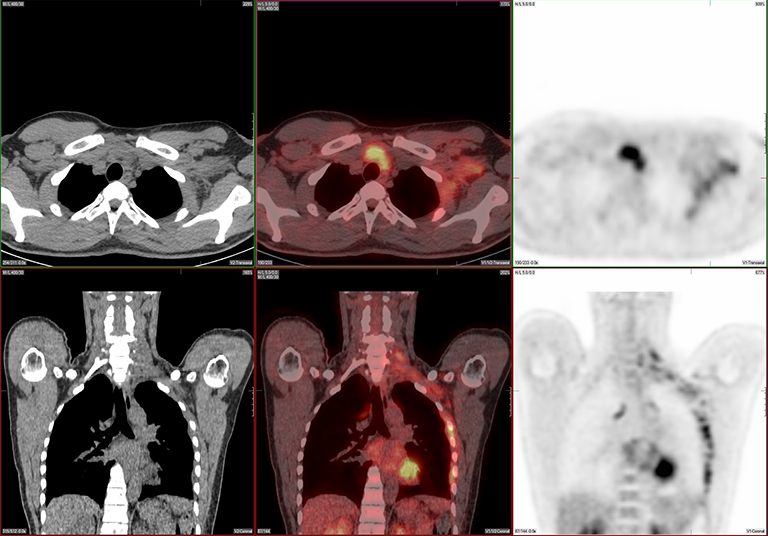 A PET/CT demonstrated involvement in multiple thoracic lymph node chains, as well as the thyroid gland and left brachial plexus. Chemotherapy was started with adriamycin, bleomycin, vinblastine, and dacarbazine. A repeat PET/CT after 4 cycles of therapy showed complete therapeutic response. 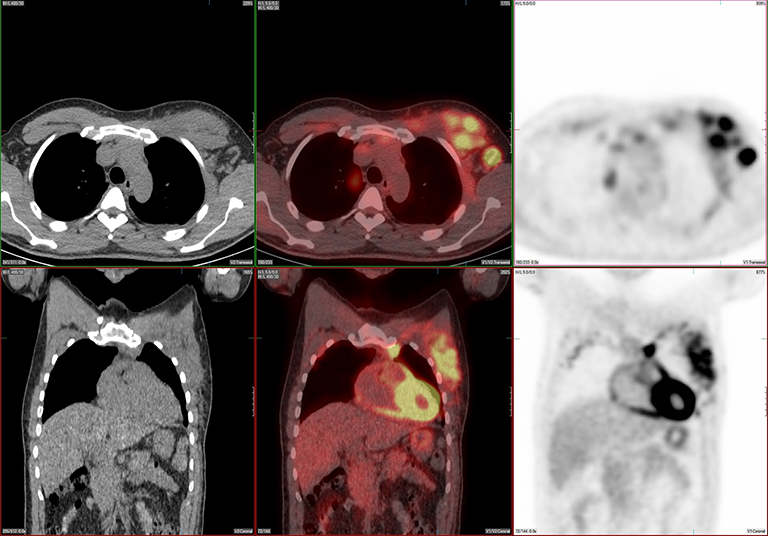 After 6 cycles, a follow-up PET/CT demonstrated no evidence of residual, recurrent, or distant metastatic disease. Clinically, the patient also improved with resolution of the left upper extremity neurologic symptoms. Craniocaudal (Figure 1A) and mediolateral-oblique (Figure 1B) views of the left breast demonstrated a focal asymmetry present at 12 o’clock at the site of the triangular palpable marker. Targeted ultrasound demonstrated a subpectoral vascular hypoechoic mass (Figure 2). PET/CT demonstrated intense FDG uptake within the left breast (Figures 3A,B), intense FDG uptake in left axillary and subpectoral lymph nodes, and mild to moderate FDG uptake in the expected location of the left brachial plexus (Figure 3C). Additionally, there was moderate-to-intense FDG uptake in the right subpectoral and multiple intrathoracic lymph nodes as well as intense FDG uptake within the isthmus of the thyroid gland (Figure 3D). 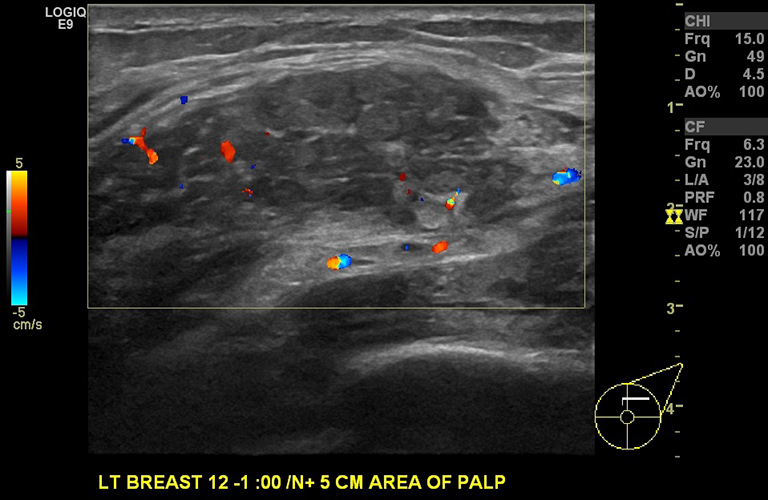 This is consistent with the biopsy-proven Hodgkin’s lymphoma of the breast with findings suspicious for perineural spread and involvement of the left brachial plexus. 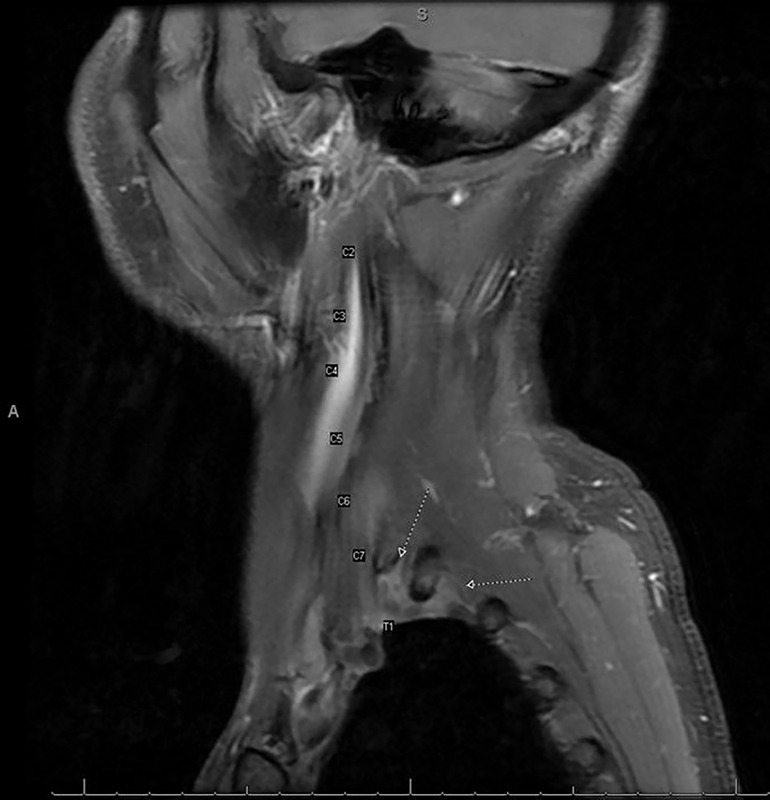 Sagittal postcontrast T1-weighted MRI of the left brachial plexus demonstrated enhancing soft tissue within the region of the left neuroforamina at C7-T1, T1-T2, and to a lesser extent C6-C7, suspicious for lymphomatous involvement of the brachial plexus (Figure 4). Hodgkin’s lymphoma of the breast. Differential considerations include non-Hodgkin’s lymphoma of the breast as well as other breast malignancies. Classic Hodgkin’s lymphoma of the breast is an exceedingly rare entity, with only a handful of cases that have been described. In the study by Wiseman and Liao, zero cases of Hodgkin’s disease were accepted as primary in the breast. Five cases in their study were classified as Hodgkin’s disease; however, all demonstrated systemic spread of disease with breast involvement as one of several manifestations.7 In a study by Jennings, only 4 cases (1.01%) of Hodgkin’s disease of the breast were included in their analysis; however, it is stated that this may not represent the true incidence of Hodgkin’s disease of the breast, as many were likely excluded.1 While it is not entirely certain whether our patient presents with primary or secondary breast lymphoma, it is favored that this patient has primary Hodgkin’s lymphoma of the breast, as the patient’s initial presentation was localized to the breast and there was no prior diagnosis of lymphoma. 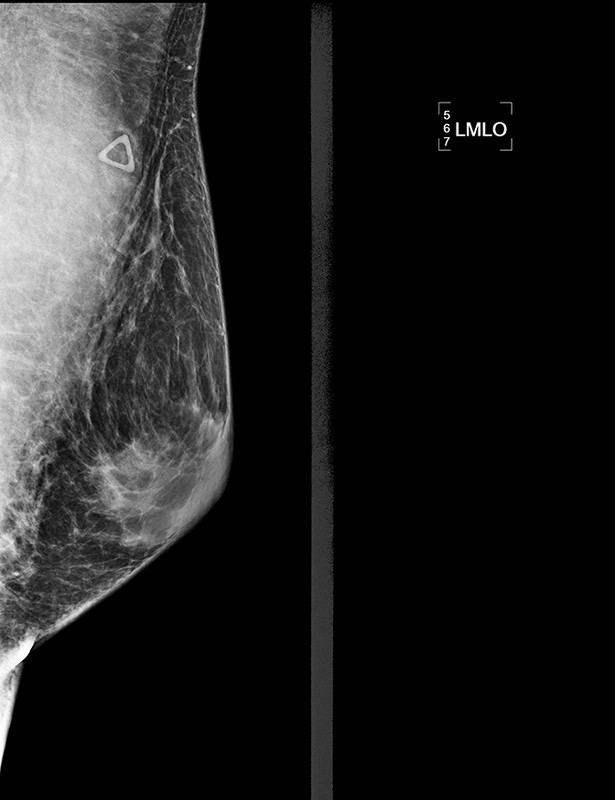 Imaging findings can also be quite variable.5,6 On mammogram, breast lymphoma usually appears as a well-defined mass or with diffuse marked increase in parenchymal density. On ultrasound, it often appears as a benign, well-defined, solid, hypoechoic mass without shadowing or enhancement.1 MRI demonstrates hypo- to isointensity on T1WI, hyperintensity on T2WI, and rapid postcontrast enhancement.8,9 Nuclear medicine PET scan demonstrates intense metabolic activity in involved areas. Tissue sampling is often required for diagnosis. Treatment is primarily with chemotherapy and/or radiotherapy. The most common chemotherapy agents utilized making up the CHOP regimen. Mastectomy has been a common component of therapy for primary breast lymphoma and remains a frequent treatment. Jennings et al recently described that chemotherapy and radiotherapy showed benefit in both survival and recurrence rates; mastectomy showed little benefit. Node status is the single best predictor of survival.1 Diffuse large B cell lymphoma demonstrates a worse prognosis compared with other lymphoma subtypes.2 In our case, there was complete therapeutic response after 4 cycles of chemotherapy. Breast lymphoma is a rare entity, the majority of which are diffuse, large B-cell lymphomas; only a few cases of Hodgkin’s lymphoma of the breast have been described in the literature. Breast lymphoma typically presents as a single palpable, mobile, and painless mass. Imaging is quite variable, and biopsy is often necessary for diagnosis. Treatment is primarily with chemotherapy and/or radiotherapy, which demonstrates survival benefit and decreased recurrence rates. Jennings WC, Baker RS, Murray SS, et al. Primary breast lymphoma: The role of mastectomy and the importance of lymph node status. Annals of Surgery. 2007;245(5):784-789. Anne N, Pallapothu R. Lymphoma of the breast: A mimic of inflammatory breast cancer. World Journal of Surgical Oncology. 2011;9:125. Hoimes CJ, Selbst MK, Shafi NQ, Rose MG, Rosado MF. Hodgkin’s lymphoma of the breast. Journal of Clinical Oncology. 2010;28(2):e11-e13. Zack JR, Trevisan SG, Gupta M. Primary breast lymphoma originating in a benign intramammary lymph node. AJR Am J Roentgenol. 2001;177(1):177-8. Yang WT, Lane DL, Le-petross HT, et al. 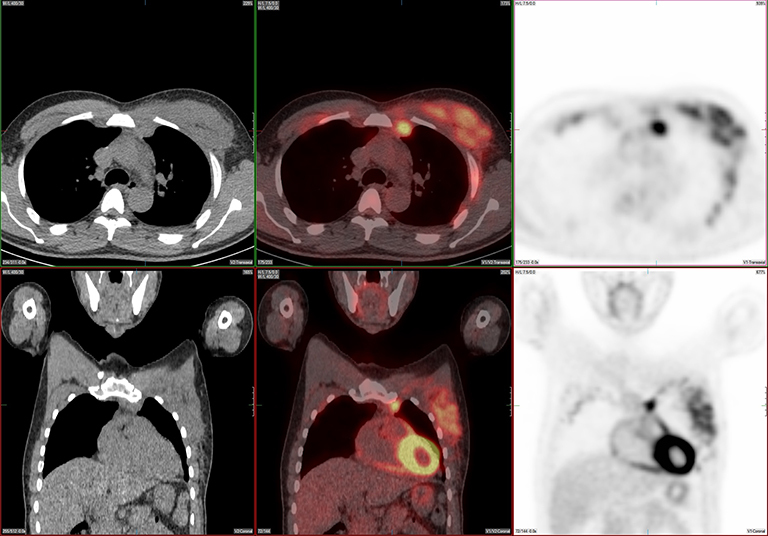 Breast lymphoma: Imaging findings of 32 tumors in 27 patients. Radiology. 2007;245(3):692-702. Shim E, Song SE, Seo BK, Kim YS, Son GS. Lymphoma affecting the breast: A pictorial review of multimodal imaging findings. J Breast Cancer. 2013;16(3):254-12. Wiseman C, Liao K. Primary lymphoma of the breast. Cancer. 1972;29(6):1705-1712. Mussurakis S, Carleton PJ, Turnbull LW. 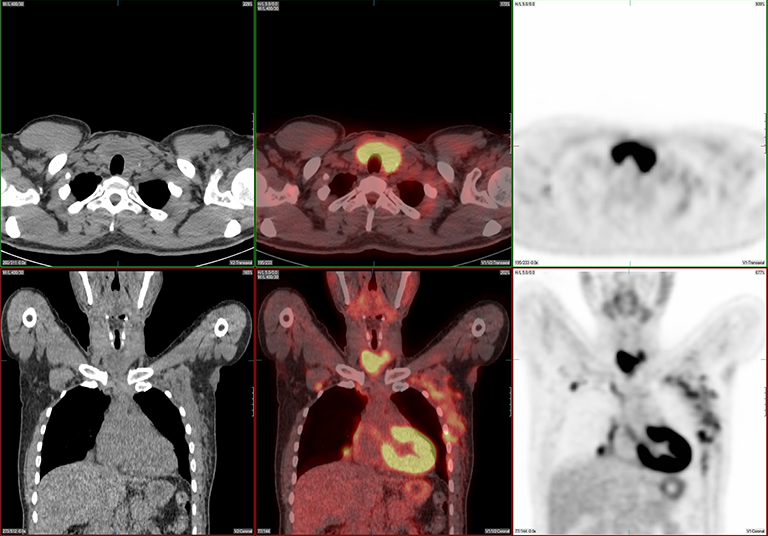 MR Imaging of primary non-Hodgkin’s breast lymphoma: a case report. Acta Radiol 1997;38:104-7. Darnell A, Gallardo X, Sentis M, et al. Primary lymphoma of the breast: MR imaging features: a case report. Magn Reson Imaging 1999;17(3):479-82. Lin DS, Dalal I. Hodgkin’s lymphoma of the breast with involvement of the brachial plexus. Appl Radiol. 2018;47(4):24-26. Prepared by Dr. Lin while a Radiology Resident and Dr. Dalal while a Diagnostic Radiologist at Henry Ford Hospital in Detroit, MI.